Violent crime, youth and gang crime, unemployment, quality of education, family instability, and racial and ethnic relations continue to rank among the top ten key concerns for our nation's civic leaders. As community leaders seek solutions to these problems, they are increasingly turning to the arts to provide answers. This compendium presents a diverse collection of 130 arts programs from across the country that address community development issues. The Institute for Community Development and the Arts has completed its second year of a three-year pilot effort to research arts programs designed to contribute to community development and to addressing some of the social problems that plague our nation. In its first two years the Institute has already examined more than 850 programs nationwide. Arts programs addressing social issues exist in small rural communities [and in] our largest urban centers that are home to millions. Research shows that more than 80 percent of the nation's 3,800 local arts agencies has developed or provides funding to arts programs that address social issues. In the 50 largest U.S. cities, a full 100 percent is involved in such programming, up from 88 percent just two years ago, and only a handful a decade ago. 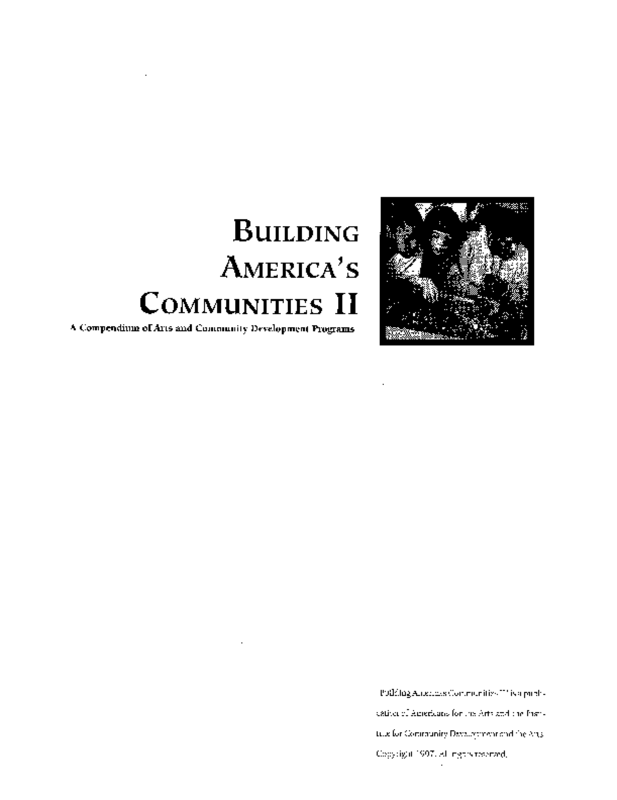 Copyright 1997 Americans for the Arts, Institute for Community Development of the Arts. All Rights Reserved.